In case you were wondering what bicycles, Northeast LA and the local economy had in common with the holiday season, we wanted to bring a very exciting and fun event to your attention! You may have been following our pilot project, the Northeast LA Bicycle Friendly Business District (NELA BFBD), launched back in February in an effort to to bring more people to local businesses by bicycle. The plan to achieve this includes implementing bicycle infrastructure enhancements to the neighborhood like bike lanes, corrals, and repair stations; offering promotional incentives to people arriving by bicycle; and overall, encouraging customers and employees to take local trips to business corridors on bicycles rather than in cars. Since we last blogged about it, we have established a Steering Committee of local stakeholders including representatives from the Eagle Rock and Historic Highland Park Neighborhood Councils, the Occidental College Urban and Environmental Policy Institue, local non-profit organizations, and active transportation advocacy groups like C.I.C.L.E. and LACBC. The NELA BFBD represents a collaboration and partnership between businesses, the community, and the City to accomplish shared goals of community building and economic development. After many months of meetings, the Steering Committee has planned a kickoff event: SHOP – RIDE – NELA Holiday Edition. The bicycle ride, led by C.I.C.L.E., will take place on Saturday December 13th, from 9:30am-12:30pm, and traverse 3.6 miles of Northeast LA’s most vibrant shopping corridors. The ride will meet at METRO’s Highland Park Gold Line Station and make shopping and dining stops at LADOT’s two local business-sponsored Bicycle Corrals: the York Bl Corral located at 5000 York Bl (sponsored by Cafe de Leche) and the Colorado Bl Corral soon to be installed at 2136 Colorado Bl (sponsored by Core Club LA). Riders of all ages and abilities are encouraged to join this leisurely ride! The event coincides with the installation of Northeast LA’s 3rd Bicycle Corral which will be located on the corner of Colorado Bl and Caspar. With Corrals installed on nearly every major business corridor in Northeast LA, people in the neighborhood can more easily visit their local establishments by bicycle. 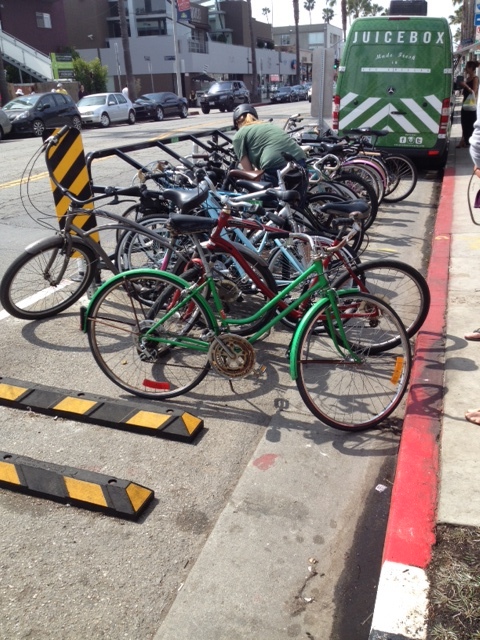 These corrals create up to 14 additional parking spaces out of one or two car parking spaces (we’ve actually seen our corrals provide parking for 18 people on bicycles in Venice), increasing the capacity of the public right of way and encouraging active transportation for local trips. The NELA BFBD is the first pilot BFBD in Los Angeles and includes Colorado Bl, York Bl, N. Figueroa St, and Eagle Rock Bl.. Council member Huizar has been a champion of people walking and biking to local businesses and this event will showcase the dynamic effect a walkable-bikeable neighborhood can have on invigorating economic activity, especially around the holidays. Ride participants will travel at a casual speed, slowing down to stroll, take in the local scenery, and explore local businesses and culture. Shopping by bicycle enables unlimited parking time, encouraging people on bikes to take their time and discover the amazing offerings within these business corridors. Businesses that offer a shopping discount to ride participants and others arriving by bicycle on the day of the ride or through the Bicycle Friendly Business Program will be listed in a map distributed to riders. For more information about the event, email elizabeth.gallardo@lacity.org. To learn more about Bicycle Friendly Business, or to opt in to the Bicycle Friendly Business Program visit http://ladotbikeblog.wordpress.com/bicycle-friendly-business-program/. Events like SHOP – RIDE – NELA would not be possible without active community members and advocates who have helped plan, sponsor, and facilitate the program. Special thanks to Cafe De Leche, Core Club LA, Big Mama and Papa’s Pizzeria, Councilmember Jose Huizar and Council District 14 staff, C.I.C.L.E., Eagle Rock Neighborhood Council, Occidental College Urban and Environmental Policy Institute, and the Los Angeles County Bicycle Coalition.